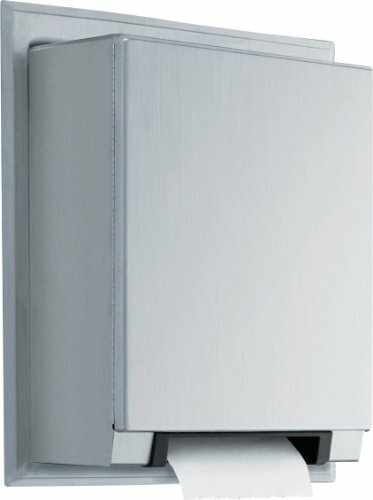 Semi-recessed mounted automatic universal roll paper towel dispenser shall be type 304 stainless steel with all-welded construction; exposed surfaces shall have satin finish. Door shall be secured to cabinet with a full-length stainless steel piano-hinge and equipped with a concealed tumbler lock keyed like other Bobrick washroom accessories. No-touch dispenser, dispenses universal, 1-1/2" to 2" (38 to 51mm) diameter cores, up to 8" (205mm) diameter, 8" (205mm) wide, non-perforated, non-proprietary rolls. 800' (244 m) long. Dispenser automatically dispenses towel when hands are placed under the towel opening. Dispenser can be powered by 4 "D" size alkaline batteries or an optional 6-volt DC power supply. Equipped with switches that allow paper length to be set at 9" (230mm), 12" (305mm) or 15" (380mm), delay that can be set at 1, 2 or 3 seconds, and "Paper Saver" feature that provides a shorter second sheet with options of 25 percent shorter and 12.5 percent shorter. Blinking LED indicates if batteries need to be replaced. Automatic transfer shall dispense stub roll up to 3-1/2" (90mm) diameter before new roll is dispensed. Measures 16" width by 18-3/8" height by 4" depth.